I had a bag of four avocados that all ripened at the exact same time, so yesterday was sort of a race against time and I ended up eating three in one day. 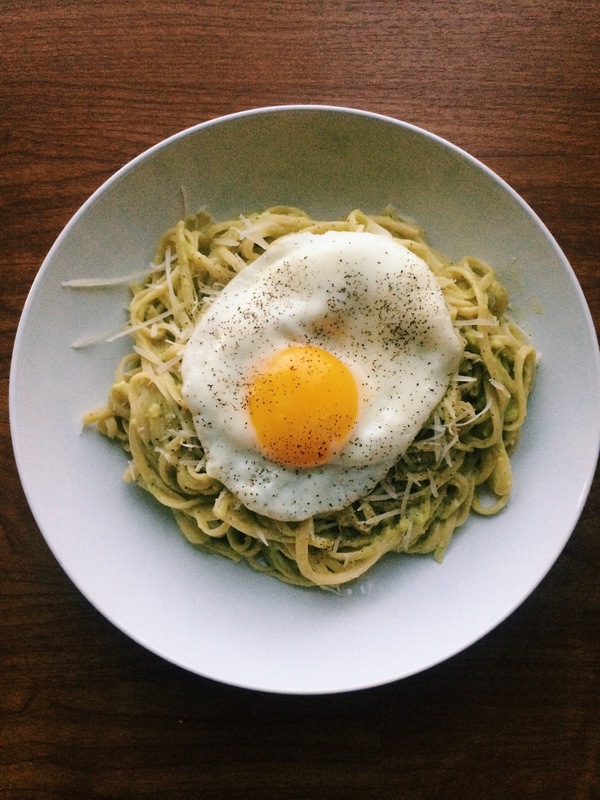 Avocado toast for lunch and then two of them went into this avocado pasta. The sauce was a bit of an unmeasured improvisation– it was avocados, a bit of lemon juice, salt, pepper, a few basil leaves, a clove of garlic, olive oil, and water to thin it out. Blended it all up and dumped it on this linguini. I topped it with a fried egg because nothing was ever hurt with the addition of an egg. And it makes the photo a lot prettier. I still have no idea how to portion pasta for a single person. This was waaaaay too much. It was good, even though it reminded me too much of pesto and I think I’ve pesto-ed myself out and it no longer is enjoyable to me. Someone else would probably like it. I’m just pesto-ed out, I say! Previous Previous post: where’s my STEAK?